The two villages of Saalbach and Hinterglemm were well-known to Austrian skiers for quite some time - international fame came to the joint ski resort of "Saalbach-Hinterglemm" through the World Skiing Championship, held there in 1991. Since then, the skiing season is busier in Saalbach-Hinterglemm's "Skicircus" travel area than ever before, and the town ranks among Austria′s most touristy places: Almost 2 million night arrangements are sold per season, only the capital Vienna and the Tyrolean ski resort of Sölden attract even more visitors. Saalbach-Hinterglemm is situated in the Hinterglemm Valley in the Pinzgau region of Salzburg; it consists of a series of smaller hamlets, all crammed with hotels and more hotels. The most famous slopes of the area run around the mountains of Spielberghorn and the Hochkogel. During the summer season, several of the hotels in Saalbach-Hinterglemm try to attract visitors with bargain deals on wellness and spa holidays, hiking, Nordic walking and mountain biking, as well as a meeting of Harley-Davidson bikers - the usual stuff, so to say. During the winter season, the selling points of Saalbach-Hinterglemm are more obvious: The town is very well-connected to Salzburg airport, which makes it a popular destination for British and Dutch package tourists, alongside with the obligatory Germans. 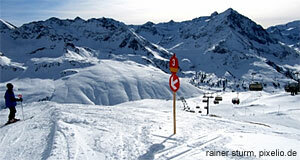 The slopes are generally gentle and suitable for beginners. The party scene for après-ski activities and nightclubs are legendary, and so especially younger people are drawn to Saalbach-Hinterglemm. Some facts and figures on the skiing facilities of Saalbach-Hinterglemm as a ski resort: 55 lifts make it easy to get to some 200 kilometres of slopes. Of these, only approximately 15 kilometres are black (difficult), 95 kilometres are red (intermediate), 90 kilometres are blue (easy). In the valley, you find approximately 10 kilometres of so-called "Loipen" (cross-country skiing slopes). Common ski-resort leisure facility are the illuminated tobogganing routes and apres-ski bars, both of which you find in Saalbach-Hinterglemm. In order to underline its position as a ski resort that attracts young people, Saalbach-Hinterglemm has engaged upon organising various "trendy" events. These include the "Rave on Snow" concert/party and the "Mountain Attack", a hiking and skiing competition. Like many other ski resorts in Austria, the people who rely on the tourism industry (so pretty much everybody), are worried about global warming and the risk of losing the basis for their wealth. In order to ensure the availability of snow even in very warm winters, Saalbach-Hinterglemm has invested a fortune in measures to fight this. Eight artificial lakes were built to act as water reservoirs for Saalbach-Hinterglemm; these lakes fuel an army of 470 snow guns, more than you would find in any other Austrian ski resort. These snow guns are high-tech devices that even work at temperatures above zero degrees - with the aid of bacteria that make the snow fluffy and ski-able. The skiing area is associated with nearby Leogang. All in all, a skiing holiday in Saalbach-Hinterglemm is a pretty safe bet. If you prefer to go there for a day-trip rather than a longer period of time, check out the so-called "snow-shuttle" that connects the city of Salzburg with Saalbach-Hinterglemm (among other skiing towns, such as Obertauern in the south-east).